rescue groups | Where Outside Is In! You are currently browsing the tag archive for the ‘rescue groups’ tag. 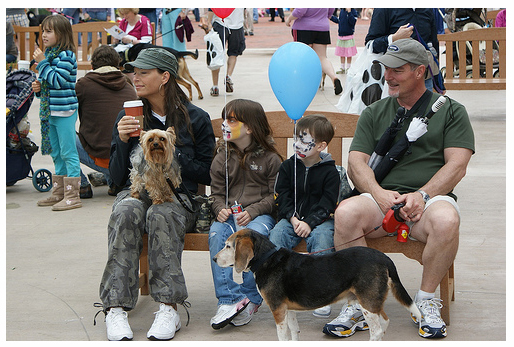 May 1st marks the favorite day of the year for our furry friends at Reston Town Center! Pet Fiesta is an outdoor festival bringing together local businesses, animal rescue groups and pet owners for one exciting day of interactive activities, demonstrations, exhibitions and animals galore. Meet dozens of animals looking for their “forever home” and then check out the latest in pet products. The kids will enjoy on-stage entertainment, face painting and caricature artists. Gather the kids and join us for a great spring day of pets and fun for the whole family, all for a great cause! Think your dog is the fastest Frosty Paw™ eater? Does your dog have the howl heard round the world? Is your pet a snappy dresser? Enter a variety of contests and win fabulous prizes! What better way to spend a spring day that walking with your best friend? The Tails on Trails dog walk is a scenic walk to raise money to help homeless dogs find loving homes. The route will take you and your furry pal around the Reston Town Center on a walk along the W&OD trail, sidewalks & footpaths. What a great way to bond with your pet and get some much needed exercise! Dog walk begins at 10AM rain or shine! Rescue groups will showcase adoptable animals to potential forever families. The event will also host nonprofit animal welfare organizations dedicated to educating the public. The event runs from 9am – 4pm. View the full event schedule. This year’s Fiesta features exhibitors of pet products, nonprofit groups and rescue groups. Bring your leashed pet to do some shopping, meet new friends, or maybe even adopt a new family member! Check out the list of nearly 100 organizations participating here. Pet Fiesta benefits GoodDogz.org, an organization dedicated to educating potential dog owners on dog selection and care and supporting the efforts of rescue groups.